Dave in his usual (Pre Anna) form. “It doesn’t look like we’re going to fall in love tonight, so we might as well go climbing,” I remarked to my friend Dave Black, as the party we were attending in Flagstaff started to dwindle. “Sounds good. I’ve got some food in my truck, and the climbing gear is always loaded,” he replied, as we climbed into his old Dodge four-wheeler. We arrived at the Granite Mountain trailhead about three in the morning and quickly fell asleep in the parking lot. The summer sun was warm, and we awoke groggily at about eight. “What’s for breakfast?” I asked, as I crawled out of my sweaty down bag. “These sardines ain’t bad, and we still have a few beers left,” Dave replied, then quickly guzzled a warm Budweiser. We quickly loaded the rack and rope into our rucksacks and ran up the trail to the crag. 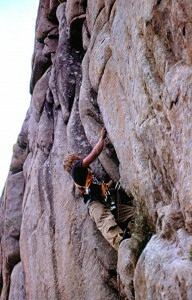 The first pitch felt quite easy, and I scrambled quickly to the top and set up a belay. John on CW Hicks ? 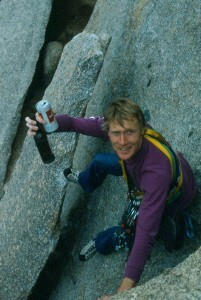 This was our third attempt at the crux pitch, and Dave was very eager to get to the top. He scrambled quickly up the 5.9 dihedral formation that we had more-or-less memorized and placed a couple of bomber stoppers along the way. “This is where we fell off last time, so watch me close,” he reminded me, as he inched his way up the 5.11 moves. “I did this in my dream last night, and it felt easy,” he added. “I can’t get my damn leg to relax, and my arms are getting pumped,” he said, while clinging to the steep cliff. He took another desperate lunge, this time managing to grasp the tiny hold that he had missed on the last attempt. 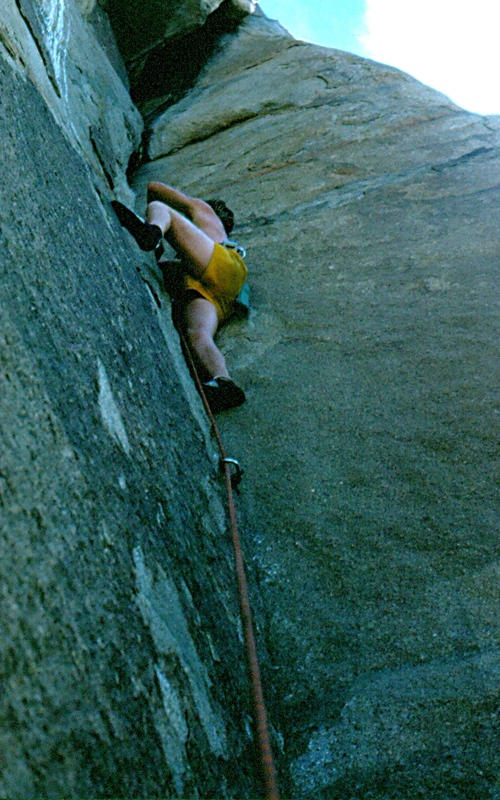 “Try to work one of your feet up to that next hold!” I encouraged, as I got ready to catch another fall. He had managed to gain another two feet of altitude, so he fell about four feet farther, but the protection held again. “Damn it! I really want to get up this route,” he said, as I lowered him back to the ledge while he examined the wound on his left knee. I quickly scrambled up to the stopper that was now welded into a small crack in the granite face. My pace slowed to a crawl. There was another very small foothold close to the awkward one, and the combination allowed me to gain the small finger hold without a lunge. It was a very strenuous move, but I managed to find a larger foothold and tried to place another piece of protection. “Watch me! I’m barely hanging in here!” I told Dave, as I struggled desperately to place the stopper. The new foothold created a much more balanced stance, and I managed to place another bomber anchor. I wasn’t ready to give up yet, so I tried to rest, holding still in my awkward stance. The next move required balancing most of my weight on a small foothold while I tried to extend upward to a reasonable hold in the thin crack. The hold was almost in reach, but I was a little too anxious to grasp it. The lunge upset my balance, but the stopper held, and the fall was only about four feet. “Is it my turn yet?” Dave asked anxiously. “OK,” I answered, somewhat reluctantly. A few minutes later, we were standing on top of the crux pitch. “Nice lead Dave. We finally did it. Foss is having a big “Reggae” party on Fountaine Street tonight with lots of wild woman. Lets go celebrate. ”Most of the fun things are dangerous and alcohol is definitely one of them, but Dave has reformed his evil ways and is happily married to a beautiful Peruvian woman.